At 1300 UTC every team apart from Sun Hung Kai/Scallywag had broken the magical mark of sailing 500 miles in 24 hours, lapping up the fast sailing that the stable north easterly breeze has granted them. Dutch-flagged Team Brunel continued to lead the charge, opening up their advantage on second-placed Dongfeng Race Team to 20 miles, with Turn the Tide on Plastic another 13 miles behind. With the gap between first and third less than two hours, the sailors know there is no margin for error. With such little difference between the teams at this stage of the leg, gains are won and lost by the smallest of changes – a slight tweak to a sail or a tiny alteration to the angle sailed. Turn the Tide on Plastic skipper Dee Caffari said finding the right balance was a constant dilemma. “When the fleet is as closely matched as this one is and everyone is in the same conditions we all race at speeds similar, only separated by a decimal place or two of boat speed,” she said. “This means that if you make a change it will ultimately cost you in that next position report. “If you make two changes then it will really show. With each position report we had been clawing back the 0.3 or 0.4 of boatspeed to match or go faster than those around us, and then we made two sail changes within one position report and that cost us dearly. 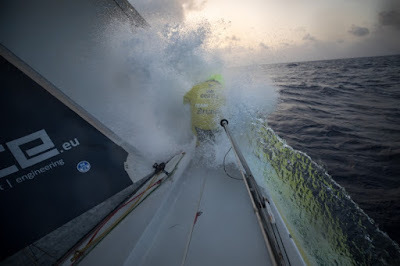 The 11th day of Leg 8, from Itajaí in Brazil to Newport, USA, saw the fleet crest above the northern tip of South America as the battle continues around 500 miles south-east of the Caribbean. With all seven teams now enjoying similar windspeeds of between 18 and 20 knots, the time for strategy is over for the moment, replaced by a quest for all-out straight-line speed. Team AkzoNobel, in sixth place, had the biggest cause for celebration on Thursday afternoon as they notched up 520 miles in the last 24 hours, the best mark in the fleet and some nine miles more than Brunel managed. On the Spanish boat MAPFRE, the crew continue to deal with power issues that are preventing them from operating their swinging keel to full effect. “The biggest problems we have with the keel are two,” skipper Xabi Fernández said. “One is it is the speed, since it is slower compared to when the engine is running, and the second is we do not know exactly where the keel is. “When you try to sail as best as possible, it is very important to know where the keel is at all times and use it to trim as you do with a sail or any other part of the boat. “Apart from all that, in each manoeuvre at least one person has to be down below to move the keel manually since no command works from deck. “Obviously this does not help and it is very possible that if the fleet compresses in the end it can play a bit against us but once again it is what we have. But it falls to race veteran Bouwe Bekking to put the state of play in perspective as he reflected on how enjoyable the racing is, especially from his position on Brunel at the front of the fleet. “Maybe I should kick myself just to remember how nice the sailing actually is, although it feels a bit boring, with not so many changes happening in the trade winds. “Now and then we get a black cloud that gives us a couple of extra knots of wind, and that’s the only exciting thing happening. “So far we can't complain about the way we are going, but from today onwards it will get a bit more tricky as the wind will start lifting as we slowly approach the high pressure system. But that is for another day. Today is about fast sailing in strong breezes and over warm waters – dream conditions for every Volvo Ocean Race sailor.